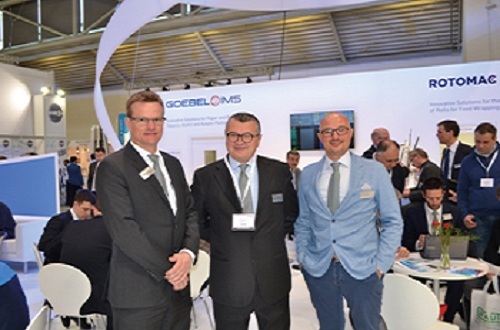 It was the first time Goebel IMS appeared at CHINAPLAS 2015 as one unit, following the merger of the German company Goebel Schneid- und Wickelsysteme GmbH and Italy’s IMS in March. Both companies are high-tech slitter rewinder manufacturers and were members of the IMS Deltamatic Group headquartered in Italy since 2013. Goebel established its direct subsidiary in China three years ago. It was difficult in the beginning, admitted Mr Hollmann, but business is now staying firmly on a growth path, with established technicians and workforce to provide sales and after sales services for the Chinese market. A spare parts warehouse was subsequently added in 2013 to offer timely services for its customers, a “much liked move” as described by Tao Ming, General Manager of Beijing Goebel Slitting Technologies Co. Ltd.
Three MONOSLIT GIANT, a signature product of Goebel, are currently running in China. The machine, reportedly the widest and fastest slitter rewinder in the films market, boasts a working width of 12,000mm and convert film webs at speed up to 1,500m/min. Mr Hollmann observed a certain level of saturation in the standard packaging market, and therefore put its focus on specialty products such as battery separator films and optical films at this year’s show.